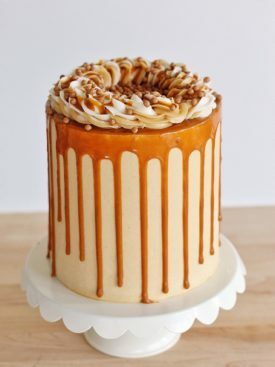 Banana Peanut Butter Caramel Cake – Tender banana cake layers with banana cream cheese frosting, whipped peanut butter frosting and salted caramel. A banana-based cake has been on my list for a while now, but I couldn’t decide what I wanted to pair it with. There are just too many options: chocolate, peanut butter, coffee, cream cheese… the list goes on and on. While it sat on my list of cakes to make, my friend told me about a milkshake she had at the Shake Shack. The shake was made up of custard ice cream, bananas, caramel and peanut butter. After I lifted my jaw off the ground, I wrote it down and decided right then that it would be the inspiration for this cake. My banana cake recipe is based off a recipe from Sweetapolita (cake goddess). The recipe, unfortunately, doesn’t work great in high altitude, so I made a few adjustments. The first change I made was to add more flour and reduce some of the sugar. Sugar always seems to be the culprit of sinking cakes, especially in high altitude. I also added a bit more buttermilk to ensure a super moist cake. The last thing I wanted was for this cake to be too dry and crumbly in texture and taste like a muffin! I’m pleased to say, this cake is no banana muffin. It’s definitely banana CAKE. Flavorful. Moist. Delicious. To add a little more banana flavor throughout the cake, I used Banana Emulsion in the frosting. Not too much, though. Just enough to amp up the flavor. And what pairs better with banana than peanut butter?! Nothing! (Certainly not in my opinion.) This light peanut butter frosting is the perfect addition to this cake. 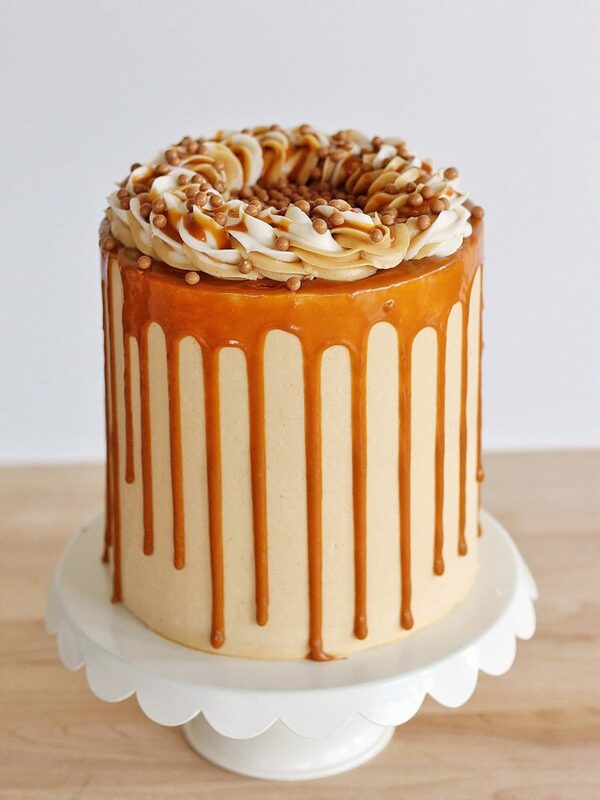 To top it all off, I added some salted caramel between each cake layer and on top of the cake. 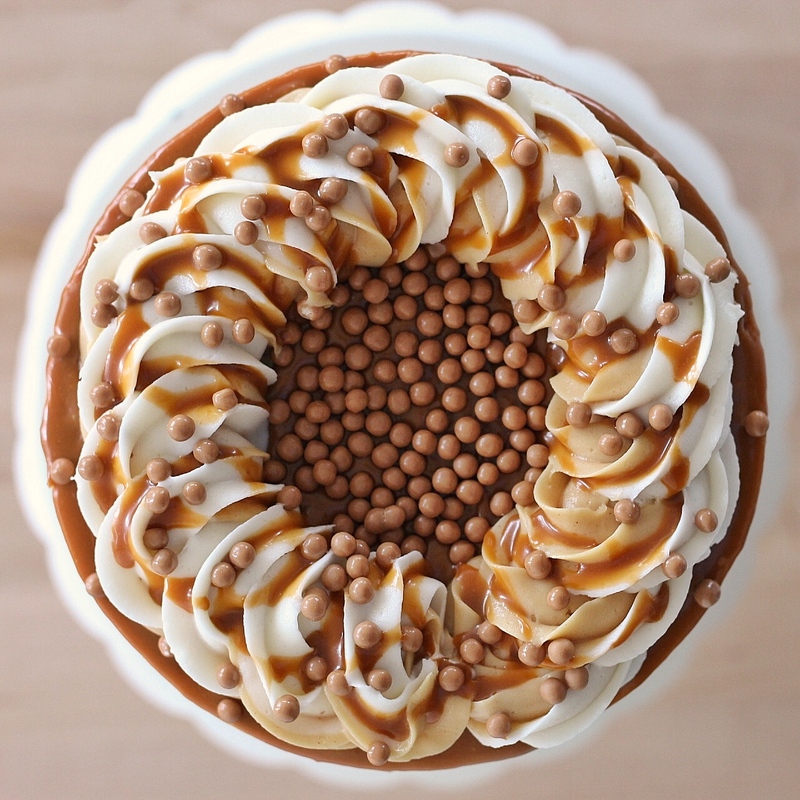 I also sprinkled the cake with THESE salted caramel crisps from Orson Gygi. I think you’ll love how you get a hint of salt with each bite of the sweet banana cake and peanut butter frosting. And here’s a quick video to show you how to assemble and decorate this cake. 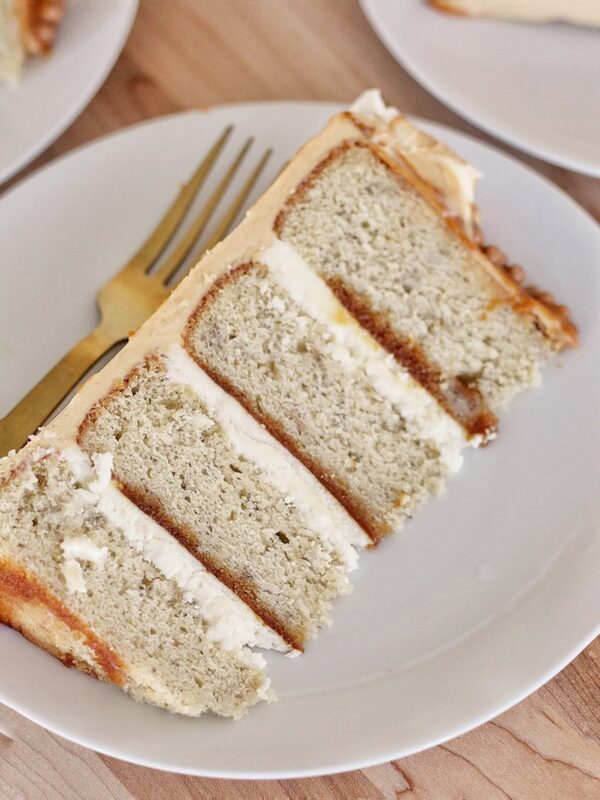 Tender banana cake layers with banana cream cheese frosting, whipped peanut butter frosting and salted caramel. Preheat your oven to 350 degrees F. Spray four 6-inch pans (or three 8-inch pans) with nonstick cooking spray, line the bottoms with parchment paper, and spray again. Set aside. In a medium bowl, sift the flour, baking powder, baking soda and salt. Set aside. In a stand mixer fitted with the paddle attachment, beat the butter, oil, and sugars on medium-high speed until pale and fluffy, about 5 minutes. Lower the speed to medium and add the eggs, one at a time, mixing until each is fully incorporated before adding the next (about 30 seconds). Add the vanilla. Divide the batter evenly between the four pans, using a kitchen scale for the best accuracy. (For this recipe, you'll have about 15 ounces of batter in each of the four 6-inch pans or 20 ounces of batter in each of the three 8-inch pans). Carefully smooth the batter with small offset palette knife, and bake until a toothpick or skewer comes out clean, about 25 to 30 minutes. The cake layers can be made up to a week in advance. If you plan to make it in advance, cover each cake layer with two layers of plastic wrap. When you're ready to frost your cake, take the cake layers out of the freezer an hour before you decorate. Combine the butter and cream cheese in the bowl of a stand mixer fitted with the paddle attachment and beat until combined, about one minute. With the mixer on low speed, gradually add the sifted powdered sugar, followed by the banana emulsion and salt. Increase the speed to medium and beat the frosting for 5 minutes, until light in color and texture. Continue to mix by hand using a wooden spoon to smooth out air bubbles. In the bowl of an electric mixer fitted with the paddle attachment, combine the butter and peanut butter. Beat on medium-high speed until smooth, about 45 seconds. Add the powdered sugar to the bowl and mix in, slowly at first until incorporated, then increasing the mixer speed to high. Blend in the vanilla extract, salt, and cream. Continue to whip on medium-high speed until very fluffy, about 4-5 minutes, scraping down the sides of the bowl as needed. Mix the sugar, water and corn syrup in a small saucepan. Bring the mixture to boil over medium heat, but DO NOT STIR! (Stirring encourages crystallization). Let the mixture cook until it turns to a golden brown/amber color. It happens quickly, so keep an eye on it. Remove the caramelized sugar syrup from the heat and very slowly stir in the cream, pouring it in little by little, to temper the cream and sugar syrup. If you pour it in all at once, your sugar will turn into hard candy. You can start adding more and more as you go along. Once the cream is mixed in, add the salt and vanilla. Stir to combine and then set aside to cool to room temperature before using. After you've leveled each cake layer with a cake leveler or serrated knife, place the first cake layer, top side up, on a cake board. Cover the cake layer with about 1/2 cup banana frosting. 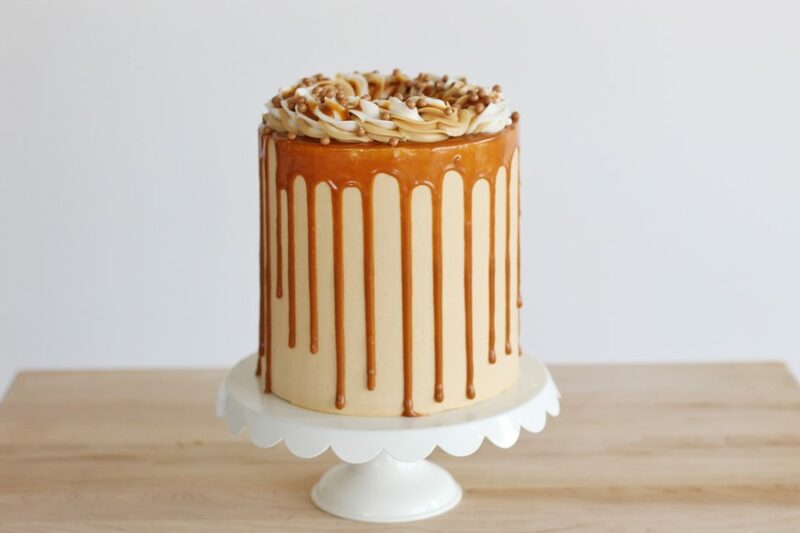 Drizzle with salted caramel and place another cake layer on top. Repeat these steps until you get to the final cake layer, which you will place top side down. Apply a thin layer of frosting around the entire cake to lock in the crumbs. Freeze for 10 minutes. 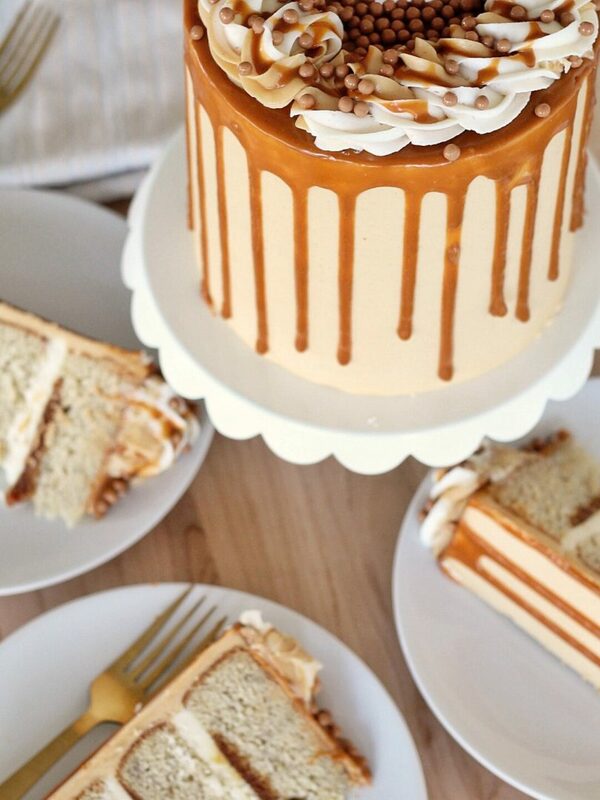 After the crumb coat is set, continue to frost the cake with the peanut butter frosting and add the caramel drip. Same goes for Almond Extracts now that I’m bugging you 😉 Do you have a favorite? I am all about natural flavors and I know you feel the same! Thanks again for everything you share; your mad skills and recipe development, it’s truly inspiring! I made this cake for my moms birthday! We haven’t eaten or decorated yet. My cake rose in the oven but then was flat and dense. I realized I forgot the brown sugar. Is this going to ruin the flavor of this cake? Oh no! Yeah, it’s definitely going to have a different flavor than it’s supposed to. Probably also a reason it fell. Also, old baking powder and over mixing the batter causes it to do that too. Wow!!! I had some leftover bananas and was looking for something new besides the same old banana bread. So glad I found this!!! I even left out the banana frosting and salted caramel (just used peanut butter frosting). Amazing. Will definitely be making this again! I think you’ll be good to go since I make this cake in high altitude as well, but if you want to be extra safe, take out three tablespoons of sugar. Sugar tends to weigh cakes down in high altitude. Are there any adjustments for making his in 8 in pans? And just an FYI- the assembly instructions don’t clarify difference between the banana frosting and the peanut butter frosting. You’d want to add an extra 1/3 of the recipe for the 8″ pans. I’m actually planning on remaking this one to clean it up and make those revisions. Thank you! Is this recipe for 3 6-inch cake pans? Just want to double check since your recipes normally make 3 8-inch cakes, your picture shows a four layer cake, and the ingredient amounts seem close to your typical 3 8-inch recipes. Thanks! This is for four 6-inch or three 8-inch. It bakes up really nicely. Hiii Courtney!! I want to try out this Banana cake and i was wondering if, is it possible to make cupcakes with this batters instead?? Would love to know! Thank you!! Where did you find the little crunchy balls on top?? Can this be made in 9” ? Yes, you’ll only do two layers though.